It happens somewhere, pretty much every day -- somebody, somewhere experiences that sinking feeling one feels when one can't get their CAT software to communicate with their writer. In this article, I'll walk you through the things you'll need to consider to fix this problem. In order for your writer to talk to your CAT software, you need to tell it what COM port (a fancy-schmancy way of saying "channel") to listen for your writer on. In order to do this, you need to open the Device Manager ... and there are seven ways to do that, and this article shows you four of them. My favorite method: Open the Control Panel folder. Control-click-and-drag the System file to your desktop, and select the "Create Shortcut Here" option. Right-click an empty spot on the desktop, select "New," then select "Shortcut, " and when asked, type in "devmgmt.msc". This will create a shortcut on your desktop which you can use to open the Device Manager directly, as opposed to the old method I had in here before, which I have struck out -- merely so you can see what was there originally. Now anytime you need to look at the Device Manager, all you have to do is double-click the System folder on your desktop, and click Device Manager devmgmt.msc shortcut and open the Device Manager directly. "Uh, Thanks! What do I do With That Again?" We'll get to that; stay with me ...! In this picture, I have clicked the plus sign that was next to the LPT & COM port icon. You can see my USB adapter there, the Tripp Lite USB to Serial Bridge ... and if you look closer, you can see that it says "(COM4)." You can either leave this widow open or write it down, but either way, you will need that number in a few moments. DigitalCAT users can click the Translations menu, and select Steno Source. To get to this window, Case folks will need to click CTRL-T, then Options, and select the Realtime tab. NOTE: This is where you tell Case if you're using a Cybra, Diamante, or a Wave. 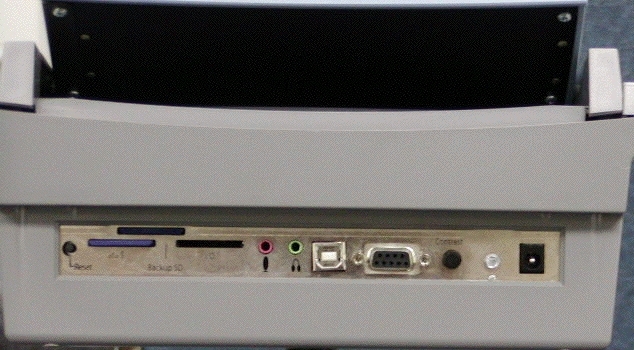 Select the élan setting. No need to check for COM with these writers. You may need to install a driver, though. To get to this window, Eclipse folk will need to click Alt-U and select Input. I'm not sure why, but despite my having told Eclipse which COM port my Flash is on, the little window still says "Realtime from: COM port," and the only way to see which COM port you're using, you have to click the Setup button to the right. Note: The Eclipse windows shown are from Eclipse 4.x. The Case windows are from Case 10.x. Once you have the COM port for your USB adapter match the number in your CAT software's window, you should be up and running! At this point, try translating something. In an effort to keep you from buying the "wrong" USB adapter, you should do some research before buying. That reasearch should include a check of the forums run by your CAT vendor. If you're still in "lurker mode," use the forum's Search feature to see if you can find what USB adapter they recommend. You might also want to check your CAT vendor's Facebook page (or group). If your CAT vendor doesn't have a forum or a Facebook presence, check their website carefully. You're looking for FAQs ("Frequently Asked Questions), hardware requirements, etc. Failing that, look for a phone number for Support. They should definitely be able to tell you what USB adapter works with your CAT and which ones won't. As an illustration to how important this is, a couple years back, I was attempting to help one of my classmates get her writer, digitalCAT, and her laptop talking. 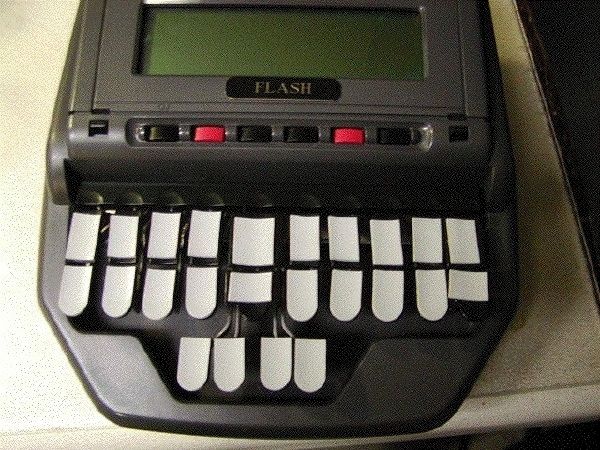 She had purchased the writer from Stenograph (a 400 SRT if you're curious), so she called Stenograph and they sold her a Keyspan adaptor ... and no matter what we did, it just didn't work. The problem was she called her hardware vendor instead of her software vendor ... and digitalCAT's support folk will automatically tell you that a Keyspan adapter and a Stentura anything will not work together! Sure enough, I swapped my ProCAT Flash in for her 400 SRT, made a few adjustments to the software, and everything worked. When I told my story to a digitalCAT Support tech, he was amazed that the Flash worked with their software and the Keyspan adapter. If you're not using a Keyspan adapter, plugging your USB adapter into a different USB port on your computer will change the COM port number. If you have everything hooked up correctly otherwise, opening the Device Manager will tell you if you are plugged into the wrong port. Make the appropriate adjustment in your CAT software, and you're back in business. "Okay; What Else Can Go Wrong?" Another thing that can go wrong is you plug everything in as usual, you find your CAT software says it can't find the writer, and on opening the Device Manager, you don't see your USB adapter listed. When that happens, there are a few things you can try: Reboot your computer and check the Device Manager again. If that doesn't work, try plugging the adapter into another USB port. If that works, try plugging a flash drive into that first port. If Windows doesn't ask you what you want to do with this new device, or give any indication that it knows the flash drive is present, then it's a safe bet that that particular USB port is dead, or has something in it. When you have the time, shine a flashlight into the offending USB port and see if you can see anything that shouldn't be there (NOTE: There shouldn't be *anything* in there!). "Okay; How do I Fix a Dead USB Port?" If you see any foreign metal (staples, paper clips, etc.) in the offending USB port, shut your laptop down, remove the battery and unplug it before trying to remove it. This is overkill, I know ... but I'd rather my readers be safe than sorry. In fact, if your school or agency has an IT department, it can't hurt to check with them and ask their advice. Being techies, they'll probably be unable to resist trying to pull it out once you point it out to them, and they'll have the tools to do it. This writer can neither confirm nor deny chasing his niece around the house with this tool after she watched a rather intense episode of "The X-Files." Mu-hu-hu-ha-ha-ha!! As for fixing a USB port that doesn't have any metal in it but still doesn't work, the repair will depend on how your laptop was put together. If your laptop's USB ports are part of the motherboard, then the only way to fix it would be to remove the entire motherboard and swap it with a new one. As you might guess, that's expensive ...! It's things like this that make you appreciate a manufacturer's warranty. If your laptop has separate boards that house each USB port, that's great! The tech would only have to remove the bad board and put in the new one -- for a lot less than the cost of a new motherboard. "Okay, But What if it's Not the Motherboard?" If it's not the software, and it's not the laptop, that only leaves your writer. The easiest way to verify that your writer is the problem is to swap in a similar writer for yours (doesn't have to be the exact same writer; just one with a serial port). This way, you're still using your USB adaptor, your laptop, and, of course, your CAT software. If the substitute writer works, then there's a problem with your writer's serial port. "Okay, So What Do I Do if the New Writer Works?" If you have just set up your system and gotten everything working between your CAT software and your writer, it can't hurt to set up a Restore Point. I recently helped one of my FB friends get her system working ... but everything I have told you to do in this article did not work ...! On a whim, she decided to load one of her restore points ... and everything worked again! Definitely something you want to keep in your arsenal of computer tricks. "Sometimes my realtime just stops. What's the deal?" Most likely the USB ports are shutting down to save power! 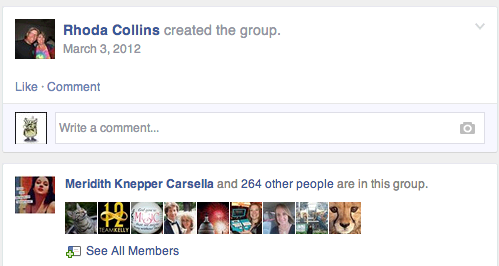 There are two groups on Facebook for folks that want to run their particular flavor of CAT software on Macs. There's the "Mac and Case CATalyst Users" group, and the newer "Court Reporter and Scopist Macintosh User Group." As you might be able to guess, one of the groups is aimed more at users of Case CATalyst, while the other is more of a "catch-all." If you are new to Macs, and you haven't read my (still unfinished) article on Macs and CATs, then take the advice I gave to one new user of one of the groups on her first day: scroll down to the bottom of the page and keep scrolling until you can't scroll anymore, and start reading the topics upwards. This way, you will find all of the answers to the easy questions right there, so you won't have to ask them. I gave this advice to a new user in one of the groups ... and about four hours later, this new user piped up with, "How do I run Windows on my Mac?" Now, I am normally a very helpful guy on Facebook. If you ask a question and I know the answer, I will share it with you. Unfortunately, in this case, I wasn't feeling my normal charitable self -- especially since I told this user exactly what to do before asking questions -- though I didn't say that bit about "before asking questions." So. I made ready to answer this new user's question, my hands hanging over the keys of my writer (thank you, Plover!) ... and I stopped. I decided to let this user figure it out for herself, since I had already told her exactly what to do to become as expert as possible on the whole subject. In fact, I watched that topic for about two days, and no one answered her question ... and I suspect they didn't answer for the same reasons I didn't -- she was told what to do, and simply didn't do it. "Okay, so why are you telling me this?" Simple -- if you want to know about running your particular flavor of CAT on a Mac, join both of these groups, scroll down to the bottom of the page for each group, and read upwards. There are only so many problems that can arise, and chances are good that somebody has already run into whatever issue you've got a question about. Save yourself some time and simply read before asking your question. Recently, I was trying to help someone in one of these groups who was having a problem getting her particular flavor of emulator to recognize her writer as being connected to one of her USB ports. I suggested to her that she open the aforementioned Device Manager and expand the COM/LPT list ... and *THEN* plug her device in. This way, she could at least see if there was some activity on the USB ports when she connected her writer. In that case, her emulator didn't allow her to see that particular setting. Once she figured that out, she was able to get her writer working with her Mac. So the big takeaway there would be to open your COM/LPT list before you connect anything; that way, you'll at least be able to see if there has been any activity on those ports. No activity means either the port is dead, or you have to tell your emulation software to give Windows access to the USB ports. • Your realtime connection depends on three things: Your writer, your laptop, and your USB adapter. 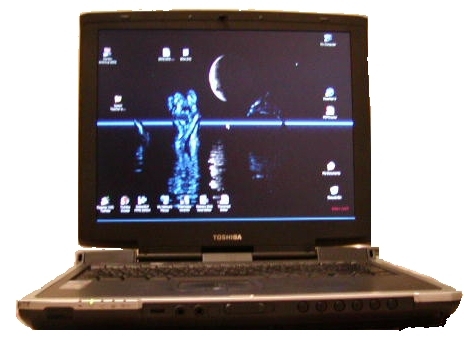 • Your CAT software has to be listening for your writer on the same COM port (or channel) that your USB adapter is on. • If you plug your USB adapter into a different USB port, you may have to change the COM port your CAT software is listening on. • If everything seems okay, try another writer. • If that doesn't work, call your local steno repair ninja! 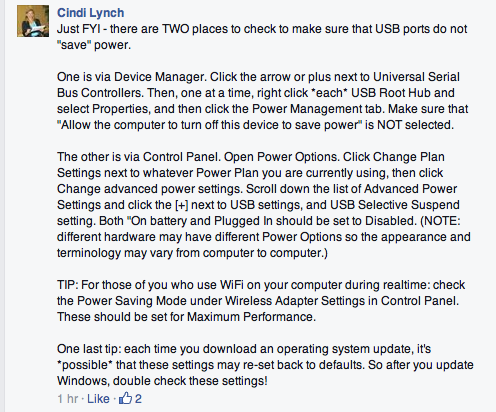 And finally, here's some tech support tips I picked up somewhere that I hope you all find of some use!